across the globe. It was developed by industry experts including 150 content writers, reviewers and contributors from the wider IT industry. These teams were nested within the ‘AXELOS Global ITIL Development Group’ comprised of over 2,000 professionals. roles in reviewing the update. Their insights and feedback have been key to the development of ITIL 4.
continue to play a crucial role in wider business strategy. digital environment and is ‘backwards compatible’ with ITIL v3. It has been streamlined to encourage conversion beyond ITIL Foundation level. must be completed in 60 minutes. to a faster, more flexible and adaptive approach. ITIL 4 Foundation is scheduled for release in February 2019. Candidates may work to achieve 17 credits from ITIL v3 to become eligible to take the ITIL Managing Professional transition module. To achieve the ITIL Managing Professional designation candidates will need required 17 credits. This will enable them to take the Managing Professional Transition module and fast track past the v3 ‘Managing Across the Lifecycle’ course and exam. If an end-learner has achieved 6 credits or more since v3 Foundation, they should continue collecting v3 credits to prepare them for an easy transition to ITIL 4 and gain the ITIL Managing Professional designation. module as soon as it is released. 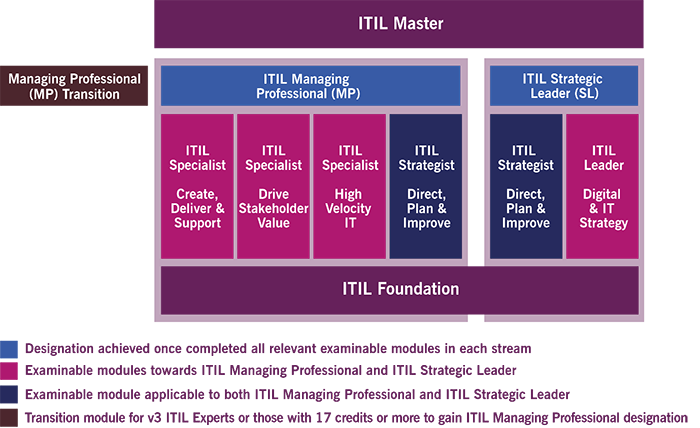 complete the ITIL Leader Digital & Strategy module. Once they have completed both streams they are eligible to transition towards ITIL Master. What is the ITIL 4 Certification Scheme? and where candidates can improve their skills and set them apart from peers. ITIL v3 Training is still available via online training or as on-site training within an organisation.